Sometimes you know when something is wrong. Over the winter I crocheted most of a sweater. All the main pieces were done, it just needed the neck working up and sewing together. But I didn’t do it. It sat in my work basket for months whilst I made up excuses for not finishing it. Finally, over the weekend, I got it out of the basket and looked at it. And admitted that I really didn’t like the shape – too long and skinny. In fact the pattern was for a man’s sweater and I should have taken this into account and adjusted it, but I didn’t, I followed the pattern. I should also have stopped working on it when I realised my tension was wrong and it was not as wide as it should have been for the number of stitches. For some reason, I pretended this wouldn’t matter as I worked and considered adding side panels… despite the fact that this would change the way the arms would have to be attached.. and their length… and their shape. 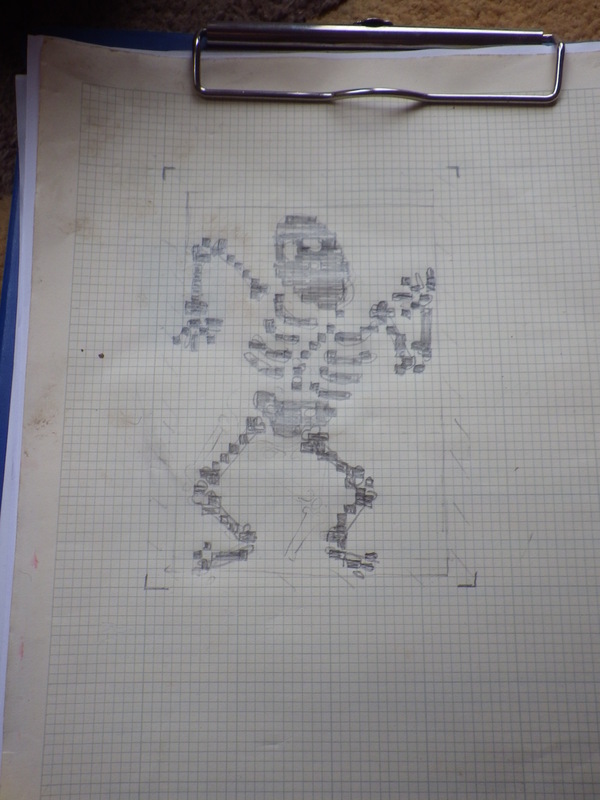 And even knowing this, I followed the pattern for the arms too, so they weren’t going to work if I made the body wider. Is it any wonder that I couldn’t bring myself to finish it off? On Saturday, however, I bit the bullet. I love the yarn and hate the way the pattern turned out. The only thing to do in such circumstances is to frog (unravel it for those of you who don’t do yarny stuff… because you “rip-it, rip-it”). 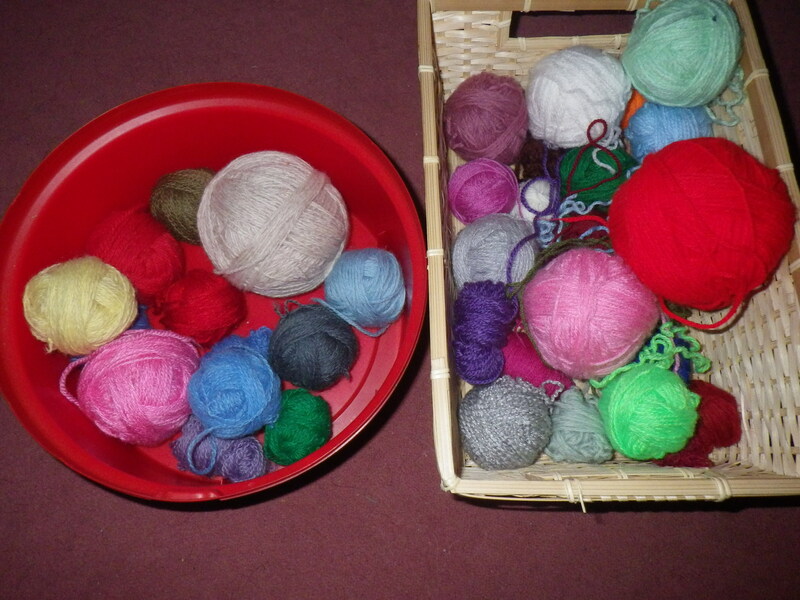 So, with much sneezing (it had got dusty from all that sitting around), I converted it back into balls. I have plenty of yarn, so now I’m going to have fun choosing another pattern to work it up into… probably a cardigan or jacket. 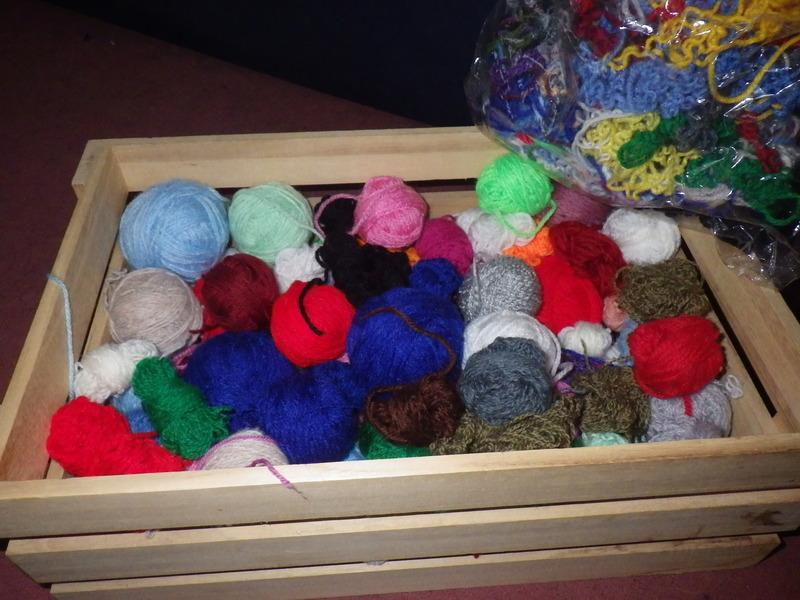 I have to admit that this is one of the reasons I like knitting and crochet better than sewing – the work can be completely dismantled and the raw material used again in its entirety if you don’t like the finished item or if it doesn’t fit. This is another in my series of ‘honest’ posts, about things that don’t work or aren’t perfect. You can read my first one (about gardening) here. This is the anti-Instagram! Today is National Upcycling Day! Well of course, once you start talking about increasing value, you have to consider what your definition of value is. For me, any re-used or repaired object that was going to enter the waste stream has had its value increased by being rescued from this fate. However, upcycling carries the suggestion of making something more fancy or using it for something other than its original purpose. This means that my repeated repairs of slippers, socks and clothes in general are not really upcycling. So, I’m beginning to wonder if I have anything that I could really describe as ‘upcycled’. 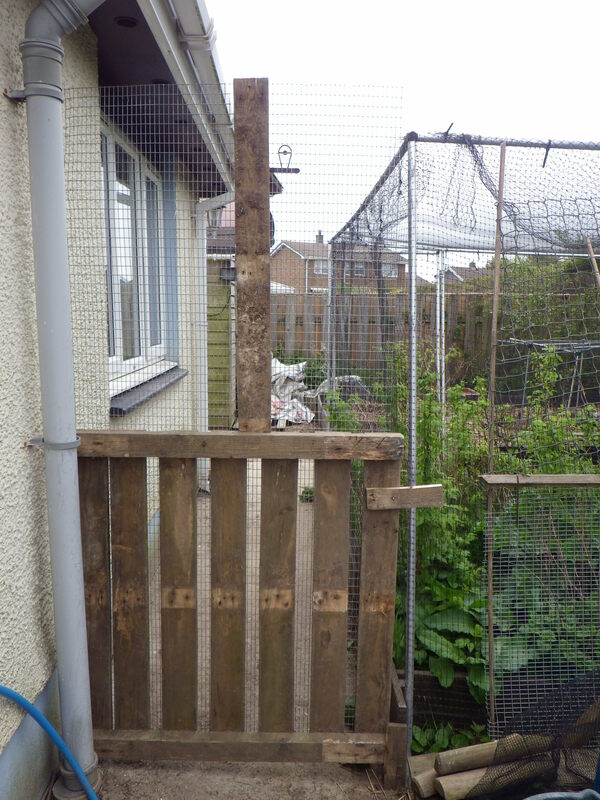 I suppose that Mr Snail’s palletgate is an example of upcycling, because he actually modified something (a pallet) to turn it into something different (a gate). 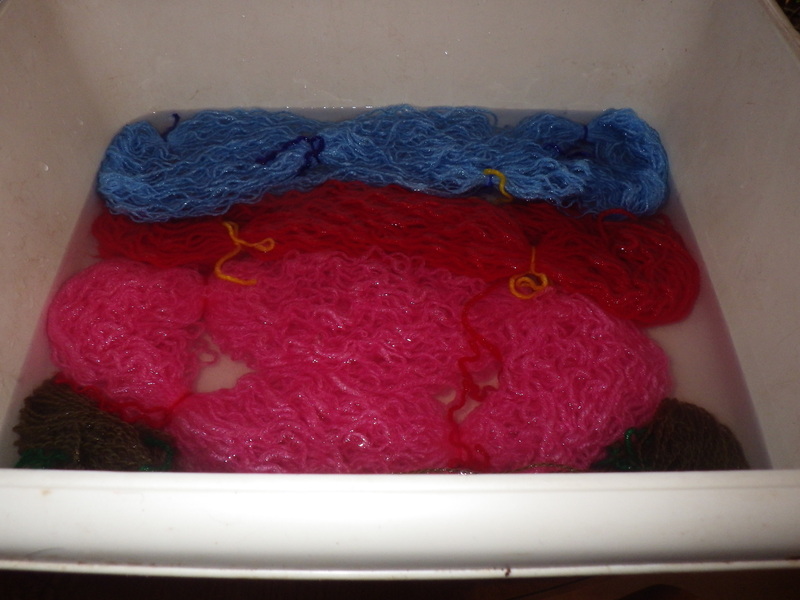 I’m also using frogged (unravelled) and washed yarn for some of my knitting projects (bath puffs and hexi-puffs for my beekeeper’s quilt). But mostly, we don’t do this sort of thing. We do repair like mad, which means that most things around the house are still being used for their original purpose – often long after most people would have thrown them away. So, whilst I salute all you upcyclers out there, I have to confess that I’m not very good at it. What about everybody else? Do you upcycle? Have you made glorious objects out of discarded items? If you want to see some great examples of upcycling check out Remade in Britain – it’s a shop, but there’s lots of inspiration too, in fact they have an A-Z of upcycling here. Also today on Twitter Jen @makeandmendyear is doing an A to Z of upcycling techniques, with links to tutorials, which is fun. So, I frogged it back to the central few rounds, increased my number of increases, worked a few more rows and increased a bit again and I do now seem to have something that might be the right shape. In the past I hated having to frog my work, but these days it really doesn’t bother me so much. Jill stated quite clearly that the instructions for the Bonbon hat were just a guide and I have, so far enjoyed exploring the shape and pattern. 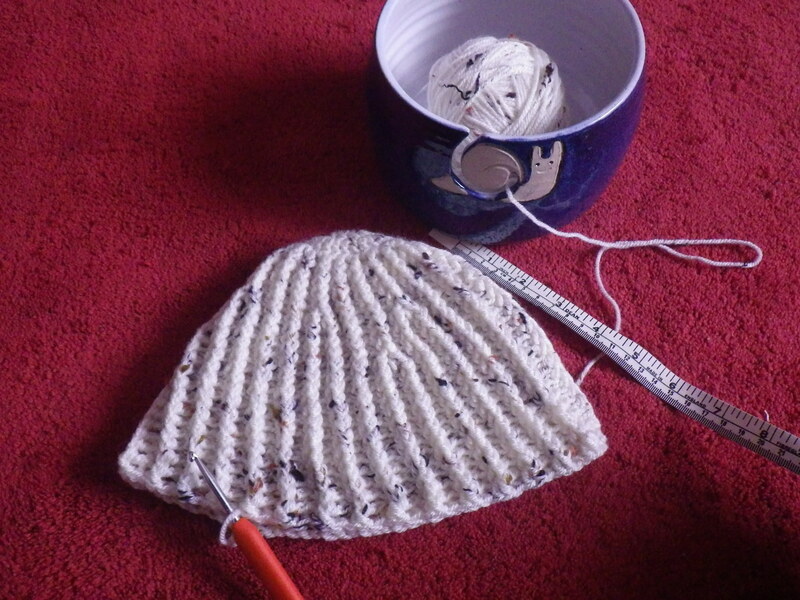 Perhaps I’m more relaxed because I don’t need this hat and didn’t buy yarn specifically to make it; perhaps it’s because I’ve discovered the joys of the journey rather than the destination; or perhaps I’ve just got less up tight as I get older. 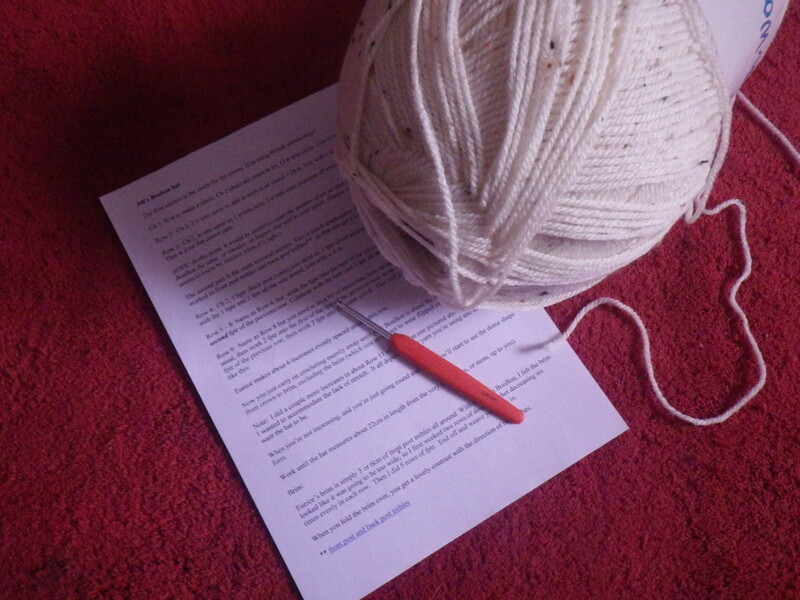 Of course, the other thing about crochet is that you only have to pick up one stitch at the point you have to restart… a much easier prospect than for knitting. Whatever the reason, I’m having fun and, in the end, I’ll have a new hat. Maybe this will work and maybe it won’t, but eventually I will know how to make a bonbon hat. Many thanks Jill for the inspiration and Katy for the yarn. Well, I ‘found’ a square that didn’t work for my blanket this week. Actually, calling it a square is wrong – if it had been a square I might have been able to do something with it, but it turned into a rectangle, several centimetres too long. I hate having to frog a piece of work, but this one simply won’t do so there is no alternative. When you look at my masterpiece blanket, you may wonder why I have chosen to crochet so many of the squares rather than knit them. 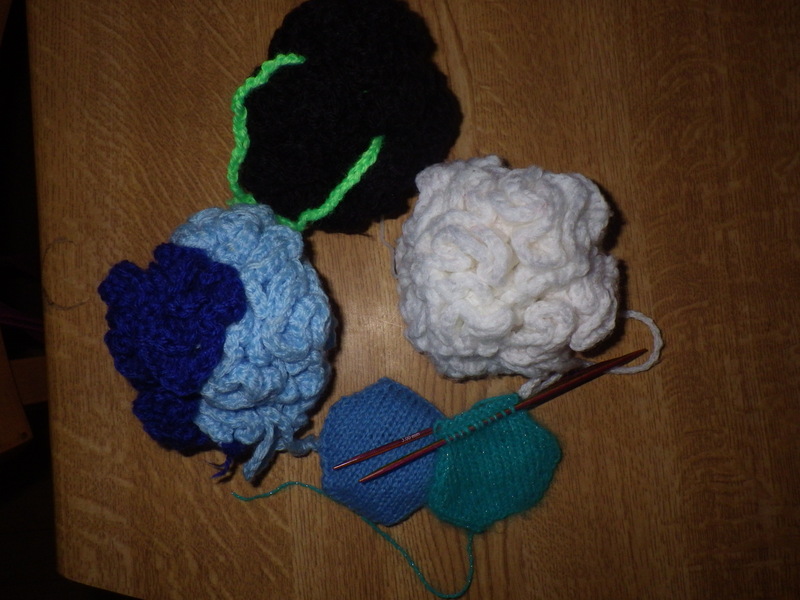 Well, the answer is that it’s easier to guarantee a square of the right size with crochet because you can work from the centre outwards and add a round of any depth to get it to be the right size. 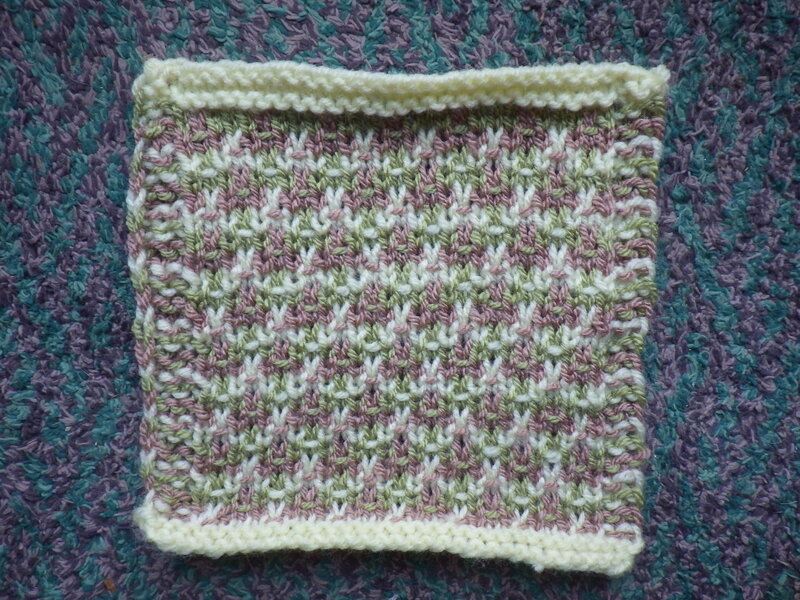 It is possible to knit a square in the same way, but it’s much more fiddly and not so enjoyable. However, I had a specific design in mind for one square intended to represent one of the designs in my portfolio. 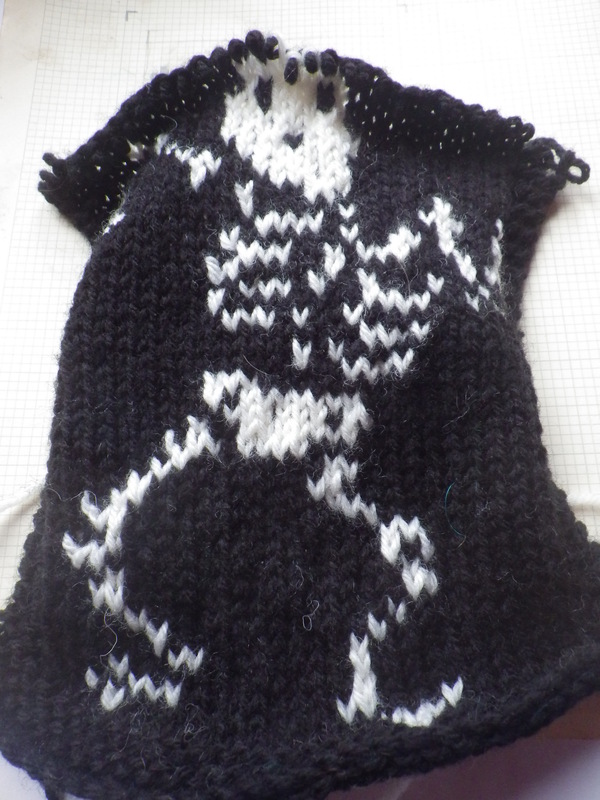 The design is about death, so I thought it would be fun to knit a square showing a dancing skeleton (for various reasons the design is entitled A dance with death). So I charted it out on graph paper (quite roughly as I know I can modify as I go along when it’s just for my own use) and set to with the needles. 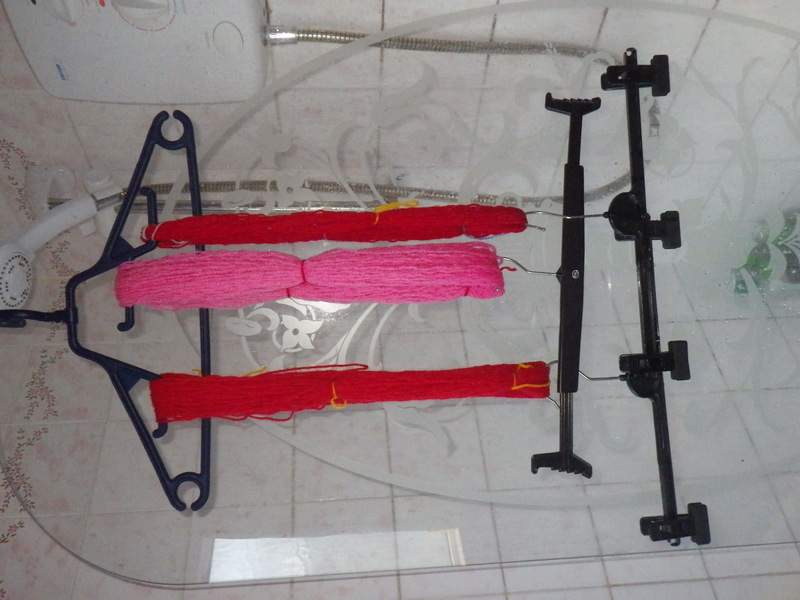 I based the size on the small and slow solutions square – also knitted and also using more than one colour. But clearly a different choice of yarns mucked things up and the result is several centimetres too long to fit the blanket design. I’m not too disheartened, though. I now know several things: my design looks ok when knitted up; the fingers and toes will be better if stitched on afterwards; and I should use 4-ply yarn. So, it’s true, every failure does provide a learning opportunity. I just hope that I can get it right next time, because I will really lose heart if, like Eddison, I have to make 10,000 attempts… or even just 10. I mentioned a couple of posts ago that I had been given some yarn that a friend acquired from Freecyle. 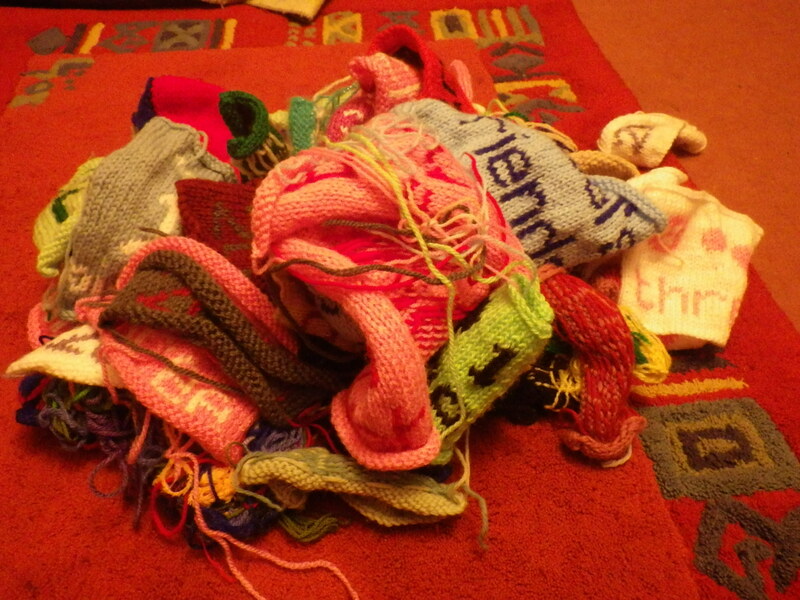 Some of this was knitted up into fancy pieces that had clearly been destined to become a number of blankets, but the knitter had abandoned the project. I’m not fond of frogging* my own work, but someone else’s is a different matter. 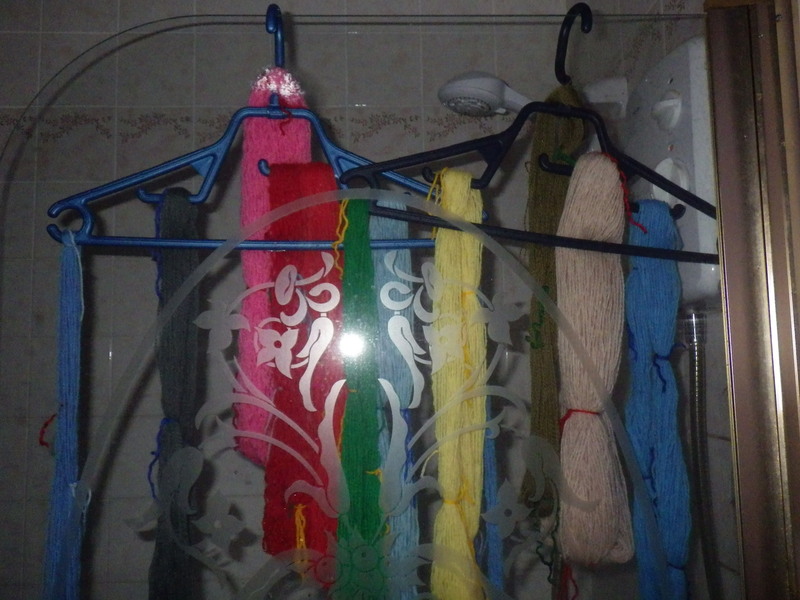 I then hung the hanks up to dry and waited to see if this was enough. 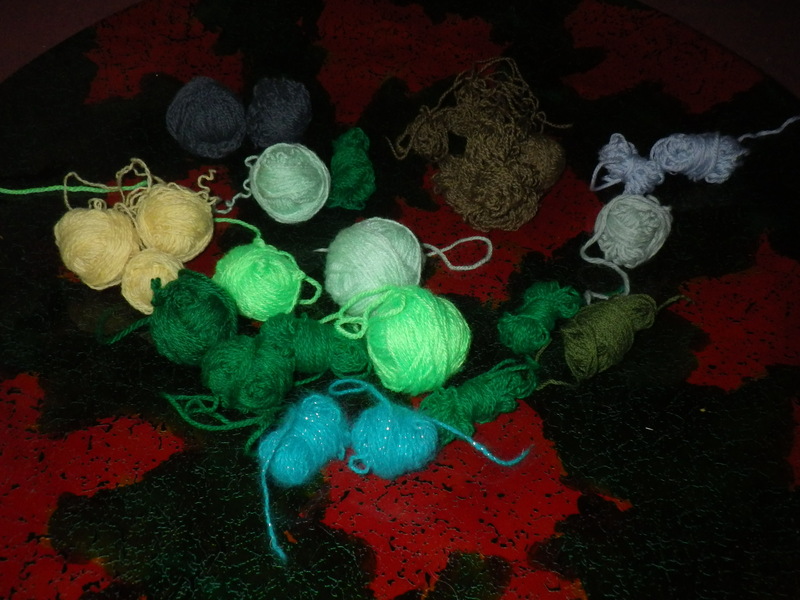 It all sounds like a bit of a rigmarole, but the whole process was very enjoyable (especially the frogging, despite being unable to get the Frog Chorus out of my head for the whole time) and I’m really delighted that I have gained some yarn for nothing more than a bit of time and have prevented something else going to landfill.